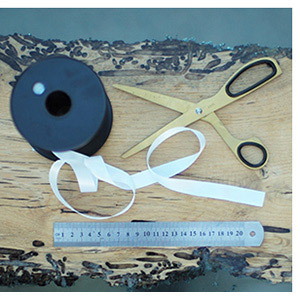 All you need is a ribbon and a ruler. 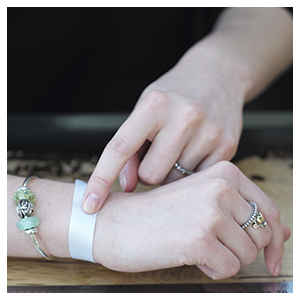 Measure where your wrist is broadest. Find your bangle size from the sizes below. Add stoppers and beads and wear your bangle. 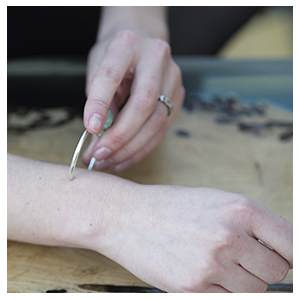 Our Bangles are available in 3 metals: copper, .925 sterling silver and 18k gold–plated. They are available in 2 styles: classic and twisted. The Twisted Bangle is only available in .925 sterling silver and copper. 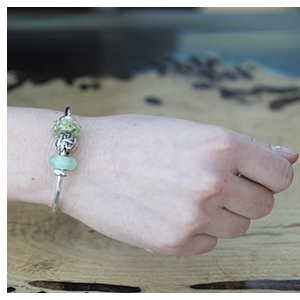 All Trollbeads Bangles require at least 2 Spacers to secure your bead(s) onto it. All of our Bangles are flexible. If you are having trouble placing your Bangle on your wrist, simply pull on either side of the Bangle to widen the opening. Then, place on wrist and squeeze to your comfort.